Cardinals manager Joe Torre knew what his young hurler Steve Dixon needed to do. He needed to channel his energy properly, according to The St. Louis Post-Dispatch. Torre's advice came after two July 1994 outings where Dixon didn't last three total innings, giving up six earned runs in the process. Dixon wasn't so sure he could take the advice, he told The Post-Dispatch. "That's the way I pitch," Dixon told The Post-Dispatch, "with a lot of energy." Dixon continued to pitch in two more seasons, but he didn't return to the bigs. His two outings in 1994 and four the year before marked the extent of his big league career. Dixon's career began in 1989, taken by the Cardinals in the 31st round of the draft out of the University of Kentucky. He played his first season at rookie Johnson City, moving to single-A Savannah for 1990. He got into 64 games in relief at Savannah, putting up a 1.94 ERA. He also saved eight games. Dixon shut down rival Augusta on three strikeouts to post an August save. "I was just trying to get the outs," Dixon told The Savannah Morning News after that August 1990 save. "I just threw fastballs tonight, nothing else." 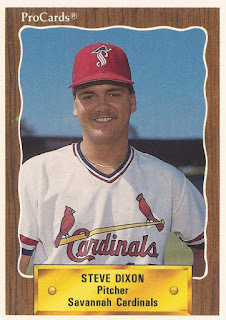 Dixon played 1991 at high-A St. Petersburg and then 1992 at AA Arkansas and AAA Louisville. He moved to Louisville full time for 1993, recording his seventh of 20 saves in June. Then, in September, he got his first call-up to St. Louis. Dixon got into four games for the Cardinals that September, 2.2 innings. He gave up 10 earned. Dixon debuted in Cincinnati Sept. 7, close enough family and friends witness him on a major league mound. "I didn't figure (my debut) would work out like this, where you could just drive to the stadium," Dixon told The Post-Dispatch. What they saw was an outing where Dixon didn't record an out and gave up two earned. His return to St. Louis in 1994 wasn't much better. Overall in his six total major league outings, Dixon gave up 16 earned in five innings of work. Dixon played 1995 with the Cubs at AAA Iowa, then 1996 in the minors between three organizations, ending his career.